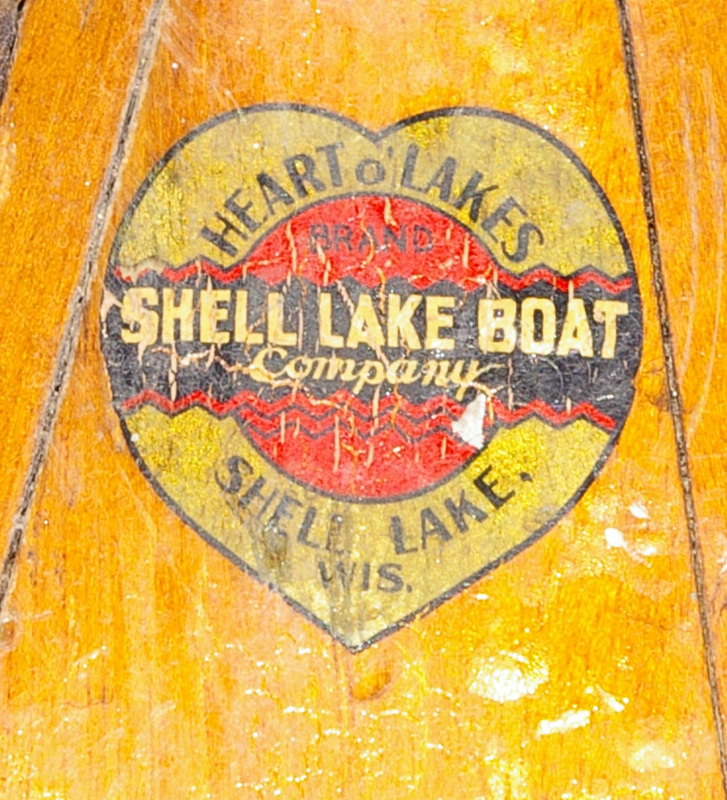 The Shell Lake Boat Company of Shell Lake, Wisconsin, was first incorporated in December 1904. In addition to canoes, the company also built a variety of outboard rowboats and hunting skiffs. Shell Lake ceased building canoes by 1957. The company changed several times throughout its existence, being sold in 1910, 1912, 1929, 1933, 1944 and 1959. Lund Boats of Minnesota purchased Shell Lake Boats in the 1960s, and Lund shut them down permanently circa 1980. The Peterson Brothers Boat Company was formed by Shell Lake Boat Company employees who left the firm when it was sold in 1929. Shell Lake canoes look very much like Thompson Brothers Boat Manufacturing Company canoes, enough to suggest that Shell Lake “borrowed” the design from Thompson. The similarity is seen in the unique way the canoes are planked (so the planks appear to run parallel to the keel when viewed from the side). This peculiar feature is common to both Thompsons and Shell Lakes. Also, some Shell Lake Deluxe models will have stringers covering the ends of the half ribs, again similar to Thompson. Unlike Thompson canoes, Shell Lake canoes usually have carrying thwarts. The Shell Lake serial number is a pair of numbers each 3 or 4 digits long. The first number is the model number, the second apparently sequential. For example, 116 123 would be model 116 — the 16’ Deluxe. The number will be found stamped in the wood or on a brass tag. The Washburn County Historical Society Museum has the serial number records for Shell Lake canoes. Shell Lake built one model of canoe in three lengths; 16’, 17’ and 18’, as well as a square ended canoe. The Deluxe (Model Numbers 1116, 1117, and 1118) and Guide canoes (Model Numbers 116, 117, and 118) were the same model, but differed in that the Deluxe has half-ribs. By 1940, they had added the small Hunter and Trapper canoe to the line. Speltz, Bob. 1982. The Real Runabouts IV: Outboard Edition. Stoyles Graphic Services, Lake Mills, Iowa. Speltz, Bob. 1991. A Real Runabouts Review of Canoes: Cedar Planked & Canvas Covered. Stoyles Graphic Services, Lake Mills, Iowa. Stouffer, A.L. 1961. The Story of Shell Lake. Washburn County Historical Society. Andreas Rhude contributed information used in this article. A number of Shell Lake catalogs in digital format are available on the The Historic Wood Canoe and Boat Company Catalog Collection from the WCHA Online Store.